This simple project is not new, but it’s so easy and incredibly practical. It’s a great way to corral plastic grocery bags to re-purpose for other uses. Quick to make, this bag saver uses an elastic technique that eliminates the tedious process of creating a casing and drawstring. Step 1) Attach the elastic. Mark a line across each end of the towel about 1-1/2″ from the edge of the towel to use as a placement guide for the elastic. 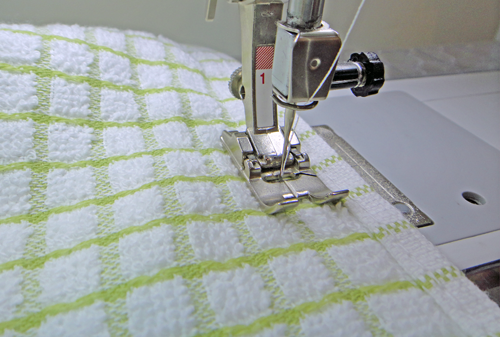 Note: If the towel has a horizontal stripe or pattern, omit the marking and select a line close to 1-1/2″ from the edge. Attach the all-purpose foot to the machine. Select the Universal stitch; set the width at 5.5 mm and the length at 3 mm. 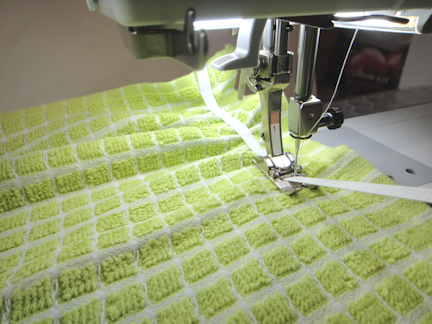 Note: A zigzag stitch can also be used. Thread one piece of elastic through the needle slot of the foot and pull it out the back. 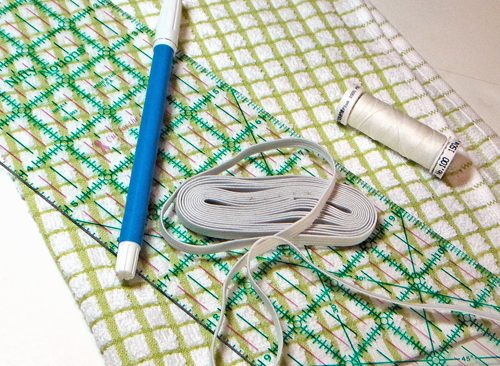 Place the towel under the foot, positioning the needle on one of the drawn lines. Sew along the line and stretch the elastic as you sew. 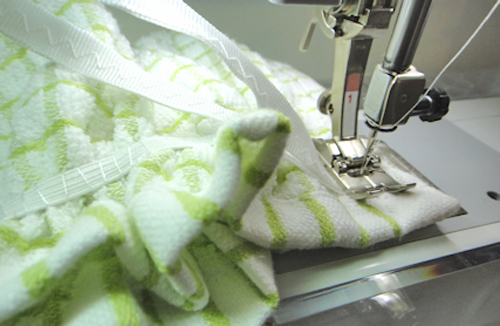 The stitch will go across the elastic, holding it in place as it gathers the edge of the towel. Repeat with the second piece of elastic at the other end of the towel. Step 2) Construct the bag. Fold the towel wrong sides together and match the long edges. Stitch the seam from the lower edge to the upper edge, positioning the side of the presser foot along the side hem of the towel. Fold the ribbon in half to form a loop and position it just above the elastic at the upper edge of the towel. Stitch it to the towel. 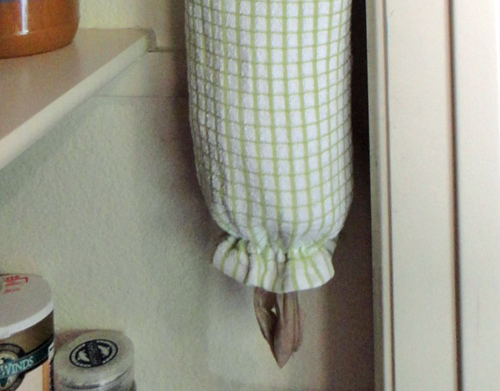 To use, simply push plastic bags into the saver through one end and pull them out one at a time when you need them. The ribbon loop can be put over a hook or nail for hanging. Where are the instructions? Can’t find them anywhere! Frustrated!! Sorry, Posy! You should be able to download them now.